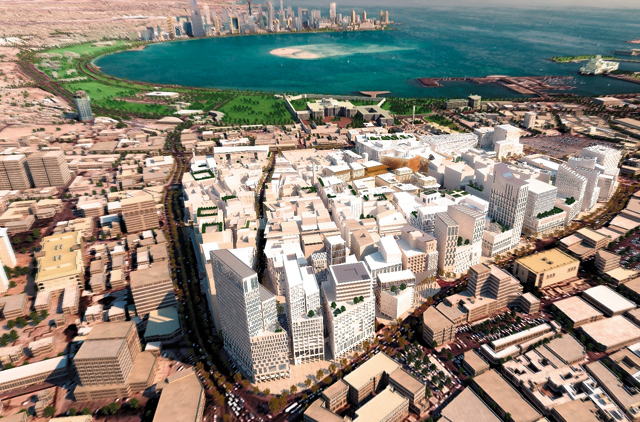 Call it Qatar's two-track real estate development strategy. The gleaming new high-rises in the upscale West Bay enclave answer to Qatar's need for a swanky real estate profile that is in tune with its soaring global aspirations. At the same time, the Gulf state is not about to let go of its traditional moorings, and a newly unveiled development — Musheireb — and its masterplan offer a sneak peek of how this is going to be achieved in the capital, Doha. A government-owned subsidiary, Dohaland, has taken on the onus of transforming the vision into brick-and-mortar with soul. "Skyscrapers and isolated living compounds are not the communities we aspire to in Doha," attests Eisa Al Mohannadi, CEO of Dohaland, which is an arm of the Qatar Foundation for Education, Science and Community Development. "We have, therefore, decided to regenerate the communities by combining the aesthetic of yesterday with the environmental-friendly and sustainable know-how of tomorrow." At $5.5 billion, Musheireb will certainly not lack in the resources to make it all happen. With a mandate to re-energise the city core close to the Emiri Diwan (which is the administrative centre on the Doha Corniche) and encourage Qatari nationals to migrate from the suburbs, the promoters have conceptualised five phases in the masterplan, scheduled for completion in 2016. Property development in Doha in recent years have been characterised by isolated land use, a loss of the sense of community and car-congested streets. Out to reverse this trend and reclaim the outdoor spaces, Musheireb's architects have deployed compact neighbourhoods, pedestrian-friendly streets and ample scope for various modes of public transportation. "This will reinvigorate the traditional kinship networks and enhance the sense of local community," insists Al Mohannadi. With work on the project being currently funded by the Qatar Foundation, the master-developer is not short of liquidity. Brushing off concerns of end-user demand, Mohannadi claims, "There is phenomenal population growth in Doha. This will drive the demand for units. The market downturn has had no impact on us." Aiming to maximise usage of public spaces, the architects plan to seamlessly integrate utilities, telecom and parking in the buildings' basements. A central district cooling system is designed in a way to maximise the use and re-use groundwater and grey water. The masterplan has taken the best of traditional Arabic design motifs through a lattice of shaded pedestrian lanes and walkways. These will merge into well-defined routes for road traffic. To compensate for the way modern buildings have ignored traditional climate-sensitive architecture, the Musheireb development is putting to use tried and tested local responses to fend off the harsh desert clime. A closely woven network of streets, colonnades, other shading canopies and varying building heights will minimise heat gain and encourage air movement. Also, urban blocks will be oriented on a north-south axis to help the sea breeze flush out the heat generated by traffic. All buildings on the 35-hectare site have been designed to environmentally sustainable standards, and with the ultimate aim of attaining a LEED gold rating. Of the total project GFA (gross floor area) of 760,000 square metres, parks and open spaces will account for a sizeable 122,217 square metres. To coalesce the fragmented social networks, the Musheireb masterplanners have proposed that the family-oriented homes be within easy walking distance of schools, shops, public squares and mosques. The residential component features 50 townhouses and over 900 apartments, and the former will share a communal majlis and courtyard garden. The area is expected to eventually house more than 25,000 people. A finer lattice of sikkata between buildings will connect people to main squares and courtyards. The master-developer believes cycle lanes, shaded pedestrian routes and a dedicated tram will encourage residents to forego use of private cars. An interchange for Doha's proposed Metro station will connect Musheireb to the airport and West Bay. Enabling works are in progress for Phase 1A of the project, and the developer is evaluating bids from contractors to install basic infrastructure and services for the buildings. Expected to be complete in 2012, Phase 1A will include an annexe to the Emiri Diwan, the headquarters of the Emiri Guards and the National Archives building, all coming under the Diwan Quarter. Including the Heritage Quarter in the east, this phase also comprises an Eid prayer ground and four heritage houses. The Barahat Al Naseem and Reemas Street will bring forth the retail vibrancy, with the latter acting as the focal point for distinctly upscale boutiques. This forms part of Phase 1B, presently on the drawing board and planned for completion in 2013. Other elements of this phase include townhouses, a school, mosque, offices, hotel and serviced apartments. The offices will be centred around Al Diwan Street. Work on phases two to four will include connecting Musheireb to the newly refurbished Souq Waqif, a mall, more hotels, offices, apartments, shops and the transport hub of Nakheel Square. "Communities in Qatar have always been close knit. People lived and worked together in harmony with the climate, the land and with each other," comments Shaikha Mozah Bint Nasser Al Missned, chairperson of Dohaland. In its bid to recapture the traditional Qatari architecture, which planners claim the city has forfeited, Dohaland has unveiled the floating Knowledge Enrichment Centre (KEC) on the Doha Corniche. Built on a ship, it is expected to become a knowledge and cultural hub of the city. Designed by Allies and Morrison, the centre will host workshops, seminars, conferences and other cultural events. Spanning 1,200 square metres, the structure has incorporated various features of traditional Qatari homes, also found in the Musheireb masterplan. For instance, the baraha (courtyard) in the KEC evokes the character of a small square between buildings. Also, many ceilings, doors, shutters and panels are adorned with calligraphy, inscriptions and ancient patterns. Symbolic of a regeneration project, the structure too will act as a bridge between the spanking new structures in West Bay and Doha's old city centre. "The KEC will ensure that the influence of Qatari culture on architecture will not drift away," affirms Eisa Al Mohannadi, CEO of Dohaland. Musheireb will feature 226 buildings and around 13,700 parking slots. It will also host a 700-seater theatre and museum. A lifestyle, luxury and business hotel introduce the hospitality component in the masterplan. Musheireb, which is Arabic for a water channel, was formerly known as the ‘Heart of Doha'.